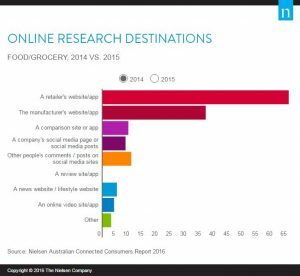 Australian males under the age of 45 are the biggest driving force behind increasing online grocery shopping figures says a new report by Nielsen Research. 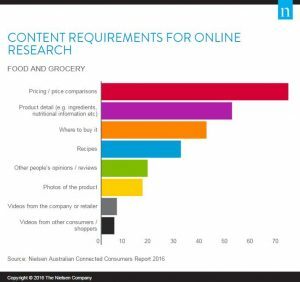 According to Nielsen’s annual Australian Connected Consumers Report published last week, 24 per cent of Australian online shoppers purchased a food or grocery item with the past six months. This is a significant increase on the 16 per cent recorded in 2014. The jump is largely thanks to young males who often want to know what is in their products the Nielsen research report says. “There is a growing interest particularly among younger consumers for specific product details and nutritional information highlighting the need for retailers and manufacturers to be very explicit and transparent with their product information online,” the report stated. Young Australians are however not the only ones interested in what they are buying with just over half of online shoppers closely investigating ingredients, nutritional information and other product details. The majority of online shoppers are visiting retailers like Woolworths and Coles directly for their product information but 40 per cent are now going to the manufacturer’s site directly. A “cold pressed raw milk” has been approved by the NSW Food Authority for sale in the state. Donut King is taking a different direction, opening a new concept store. Retail Food Group (RFG) has lowered its forecasted profits for its 2017 financial year.